MiNi D2000 - Earthquake Sound Corp. The Earthquake MiNi D Mono amplifiers are the most efficient class "D" series ever built. Available in 3 models, these amplifiers deliver unbelievable power despite of their super-compact size. 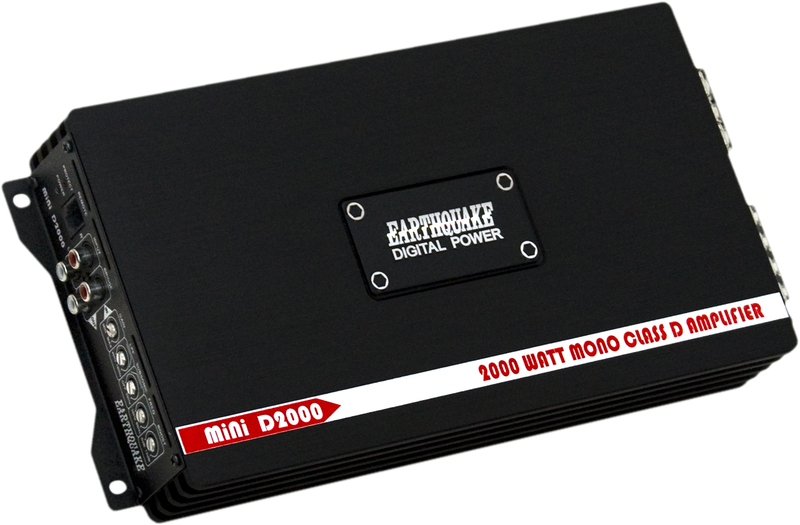 With less than 2-inch tall and 7-inch deep, the MiNi D Mono amplifiers can be installed in tight spaces of the vehicle (under the seat, behind the back seat, etc.) allowing you to keep that valuable storage space in your vehicle. One unique feature of the MiNi D Mono amplifiers is the BRIDGE IN/OUT that allows you to link 2 amplifiers together. Designed with patented Optical Control Circuitry, each of these amplifiers has a built-in protection fuse designed to handle 1 to 4-Ohm loads. In addition, the amplifier will automatically reset once the protection circuit is triggered. With the MiNi D Mono amplifiers, you won't have to sacrifice efficiency and space to get the immense power you need for your install. Better yet, due to its remarkable efficiency, you won't even need extra batteries for them.